BulletProof FTP is an FTP Client with features designed specifically for automation including automatically reconnecting and disconnecting from specified FTP servers, download files and folders on a schedule, resuming broken downloads. Its interface is overall not too clunky and it gets the job done with reasonable speed. BulletProof FTP is an automatic FTP program. 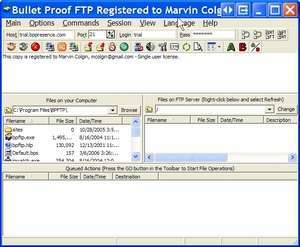 BulletProof FTP Client 2010.75.0.76 is a shareware program and can be used as a demo to try the software until the free trial period has ended. A full version of the program is available after the trial period ends. For security reasons, you should also check out the BulletProof FTP Client download at LO4D.com which includes virus and malware tests. Additional screenshots of this application download may be available, too. BulletProof FTP Client has a presence on social networks.